A balanced formula containing vitamins important to the maintenance of a healthy circulatory and nervous system. B vitamins are most effective when they are in a well-balanced formula together and they plan a key role in the release of energy from protein, fats and carbohydrates in the diet. Since any excess amounts of these vitamins cannot be stored in the body, a daily amount is required. These tablets provide a balanced nutritional supplement of thiamin, riboflavin, niacin, pantothenic acid, vitamin B6, vitamin B12, folacin and biotin. Vitamin B6 must be present for the production of red blood cells and also antibodies, the body's defence against infection. Without vitamin B6, the body cannot properly absorb vitamin B12, which may lead to tiredness, irritability and anaemia. 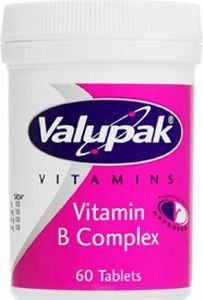 As with all stress conditions, disease, anxiety, trauma, or post-surgery, there may be a need for an increased supply of B vitamins. Do not take while you are undergoing a prescribed course of medical treatment without first seeking professional advice. Do not exceed the recommended intake. This product should not be used as a substitute for a balanced and varied diet.